The following services are provided by current students of the Seattle Agility Center. At any given time the center has over 230 students and many of them run their own independent businesses or have useful skills. Use these listings to find services locally within our own doggie community! 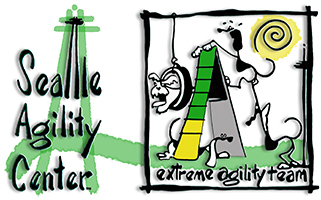 Seattle Agility Center does not guarantee the quality of the services that are listed. Full service dog grooming spa and boutique. We try hard to do our part and make your decision to lead a cleaner, greener lifestyle for you and your dog that much easier! Web Videos, DVD authoring and duplication, transfer to and from all formats, encoding for the web, full video production and Avid editing. We strive to sell unique and quality pet supplies. We are always looking for new products that are safe and fun for your pets. Dash Pet Service, licensed and insured, serves Maple Valley, Black Diamond, Covington, Enumclaw, Fairwood, Hobart, Issaquah, Kent, Lake Sawyer, Lake Morton, Renton, and Ravensdale. Visit our website http://www.DashPetService.com for more Information, Service details, and Rate$. We look forward to hearing from you by phone (425) 246-7106 or email DasherDesigns@gmail.com. At Immortal Dog we specialize in pet nutrition, helping your pet live their best life. We also have all the toys, chews, treats, supplements, grooming products and other goodies you need for your canine and feline friends. K9 Boot Camp is the Eastside's Premier Dog Walking Service! We offer hour long off-leash excursions to Marymoor Park in Redmond. We extend our services to clients in Woodinville, Bothell, Redmond, Kirkland, and Bellevue. We are licensed and insured. We offer free pick up and drop off services. Our rates are as low as $20 per walk! We also offer dog feeding, and individual walking services. call (425) 495-7921, or email k9bootcamp09@aol.com. Hi - I am Delinda Jokela, Diana's daughter. I have 2 dogs, a Cocker Spaniel named Dodger and a Boxer named Lina! Customer Care is my specialty and I would be delighted to find you a dog-friendly home/property. If you have a house or property to sell, I will help you with that too! I am a full service/full time agent with an abundance of experience in the process of buying and selling homes. Building relationships with clients is the most important aspect of my business. You will quickly notice that my approach to real estate is creative and will provide you with the results you are looking for. I even make the process fun! I would be happy to provide you with a complimentary market analysis of your home. I look forward to being of service. The Cascade Comets Dog Sports Club focuses on Flyball (a ball oriented relay race for dogs) and offers demos, classes and fields competitive racing teams. We are based in and around the Seattle area and typically hold classes and practice in Tukwila. 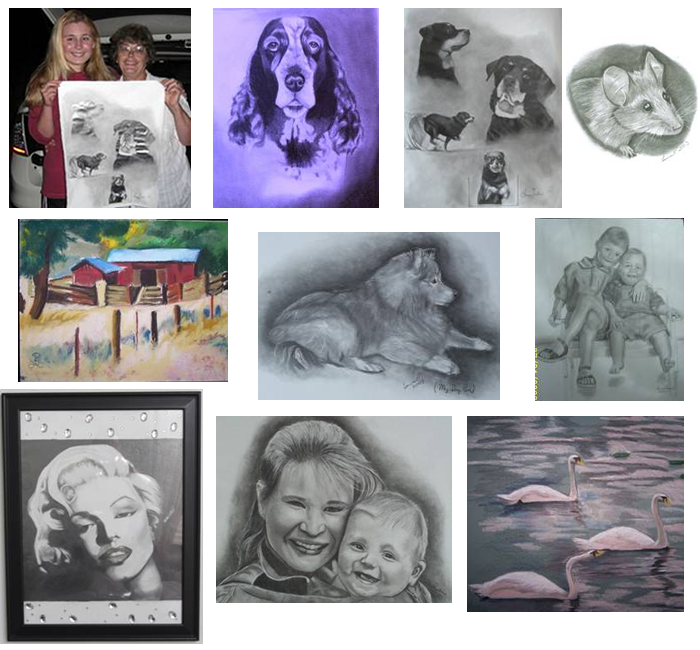 Laura Preston is a sixteen year old Seattle Agility Center (EAT) member and has been commissioned to draw people, animals, landscapes along with water colors, pastels and fashion creations since she was 10 years old. Laura has a standard rate for Medium-Large-Extra Large pieces and is happy to quote on the picture you desire. She can be contacted via email at wmpreston@comcast.net. Click here to see some samples of her work. Specializing in counter, bar & custom height stools, casual dining sets, bars, etc. located 1 mile south of Southcenter mall. For more information contact Karla or Chuck Laird at (206) 529-3680 or visit our website http://www.dininginteriors.com. Specializing in flowers for your weddings and large party, events. Serving all areas. Located in Issaquah. For more information contact Karla Laird at (425) 255-0601 or visit our website http://www.passionflowerflorist.net. Producing red and white wines in the Issaquah area. Chuck Laird winemaker, Karla Laird winery manager. For more information visist our website http://www.passionvineyard.com. For more information visit my website http://brendajones.pnwrealty.com . Kit Harris, a professional landscape designer who has been featured in Seattle Home & Lifestyle magazine, has been creating tasteful, inspiring, functional and beautiful outdoor spaces for her residential clients for the past 15 years. She is a veteran Master Gardener and has the horticultural background to give you the ideal garden for your personal desires and needs. Her first criteria for designing your yard is to incorporate your dreams along with the level of gardening ability and maintenance requirements you personally want to invest in your landscape. Along with designing plans, Act Too Landscape Design also provides garden consultations for those of you that have moved into a new home and want to identify plants, renovate older landscapes or give important horticultural or botanical information about your yard. For more information contact Kit at (206)763-3330 or kitharris11@gmail.com. IndieStills is a business that began in 2005 providing photography for independent film. IndieStills continues to do that and more. Today revenue from IndieStills photography and other creative projects is used to benefit the community. A minimium of one third of all income generated by every project is donated by IndieStills to the charity of the client's choosing. For more information visit the IndieStills website at http://www.indiestills.com. Coaching for personal and professional development at Integral Business Coach. Coaching for leadership development, career transitions and behavioral performance. Workshops in Communication and Conflict Management. http://www.integral-business-coach.com or contact me at (206) 940-9131 or anneperry@integral-business-coach.com. I am located in West Seattle at 2255 Harbor Avenue SW - Seattle, WA 98126. Licensed Mental Health Counselor at Samaritan Center of Puget Sound. Life transitions, grief, interpersonal communication, Registered Yoga Teacher. For more information visit the Samaritan Center of Puget Sound website at http://www.samaritanps.org or contact me at 206-527-2266 Ext. 359. A title for your service. A SHORT description of the service you provide. A link to your website where others can learn more about your services, or if no website, an email address and/or phone number where you can be reached. Seattle Agility Center reserves the right to decline or remove posts that are deemed inappropriate.